This year, Earth Day is celebrated on April 22. It’s a Monday, which makes it a little hard for those who have a workday to participate. Luckily, the Detroit Riverfront Conservancy is hosting its Dequindre Cut Cleanup, a day to pick foliage and debris left by the colder months, on April 13, the Sunday before. We sat down with Rachel Frierson, director of programming at the Detroit non-profit organization, to learn of how the art-packed greenway inspires metro Detroit to collaborate and revitalize the Motor City’s forgotten landscapes. 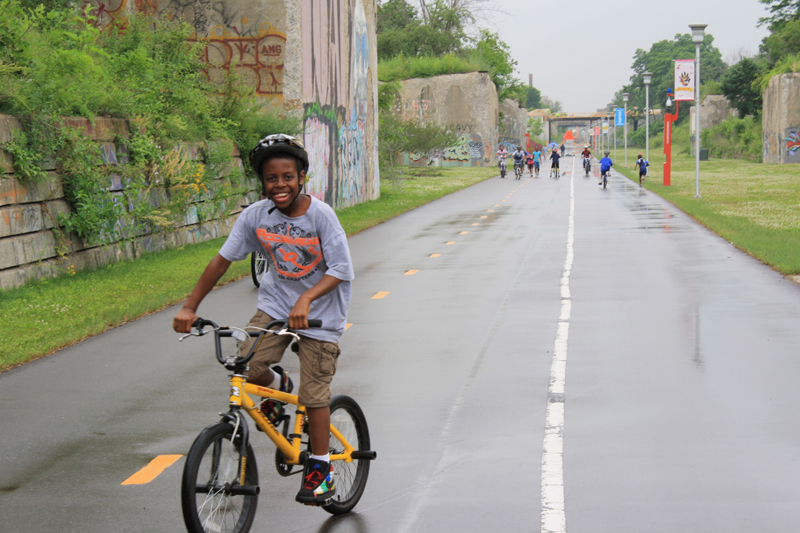 Hour Detroit: What was the Dequindre Cut like before it was revamped? Rachel Frierson: Untouched for nearly 40 years, the abandoned tracks of the Grand Trunk Railway remained at the site. During that time, it became an environmental landscape overgrown with shrubbery. So, when began our initial efforts to clean up the Dequindre Cut back in 2009, there was a lot of work to be done in creating a connection between Eastern Market and the Riverfront via a pedestrian greenway. What we discovered is that, although the space seemed forsaken, it actually served as an unofficial gallery for Detroit’s graffiti artists. Did you find any value in your discovery? Absolutely! It was important to us to honor that legacy, so that when you walk through the Dequindre Cut, you’ll see new murals that have been commissioned by the Riverfront Conservancy, but also older graffiti that might be 10 to 15 plus years old. Initially, many artists in the area were deeply concerned that the Detroit Riverfront Conservancy would whitewash everything. But we continue to engage Detroit based artists to paint new murals when others start to turn to debris. 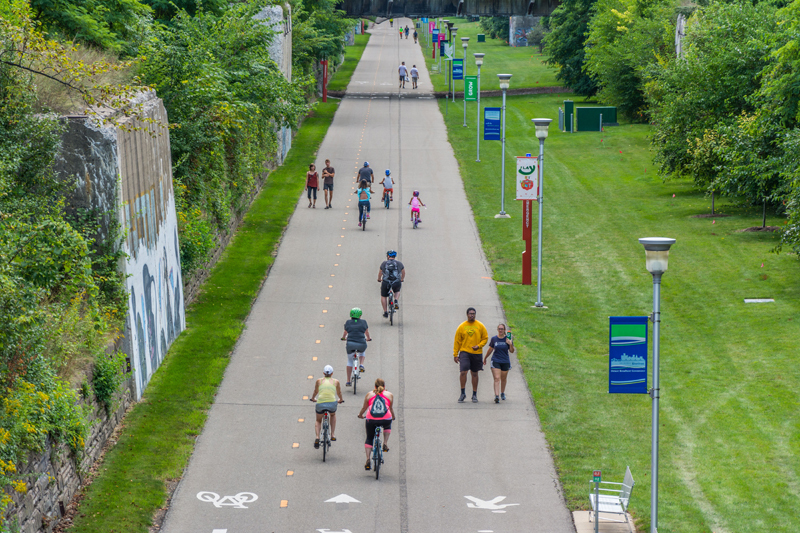 What has the Dequindre Cut become for the people of metro Detroit? The Dequindre Cut serves as a reflection of transformation and reinforces the idea that here in Detroit, things may be changing, but at the same time, we want to continue to recognize our city’s history. A big part of our mission is that we wanted to create a world class gathering space for all. When I talk about the Riverfront, it was not a safe space before our initiative. The Dequindre Cut is the same case: you would have to approach it at your own risk. Since we’ve established these plush, safe paths, there are a large amount of Wayne State students I see using the Dequindre Cut to go to school or get back from home. It is pretty remarkable. For those who can’t participate in the Dequindre cleanup, what might be an alternative way of improving metro Detroit’s environment for Earth Day? As humans, we have a responsibility to recognize that all of the litter scattered throughout metro Detroit was not dropped on us. Rather, it’s because we didn’t have a conversation with our kids or peers that emphasized putting our trash in a receptacle, and not one that’s already filled. Make sure you hold onto your debris. Also, we all need to work on being a little less wasteful, whether that means using reusable materials, for example, a refillable water bottle. But those are the small steps. Here on the Riverfront, we are really interested in ecological transformations as a whole. The cleanup is an opportunity to tell people about the ecosystem of the Dequindre Cut, the native plants and animals found throughout, and to learn about the community at large. What have been some of the more unexpected results from arranging this cleanup for the community? The Detroit Riverfront Conservancy is about 15 years old, and we started arranging the cleanups close to three years ago. And every year, we’re just surprised by how many people come out and show their support. Last year we had to cancel because of rain, but 15 to 20 people came out anyway and helped. We’ve seen this immense sense of ownership from city residents, and this that’s result of our collaborative relationship. How are you celebrating Earth Day in metro Detroit? Tell us in the comments below.